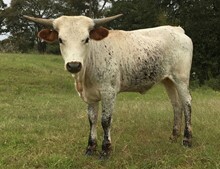 You can't swing a cat without hitting 70 and 80" cattle in this young gal's pedigree and she measured 71" at just 5 years. She is everything we love- eye catching, big in all the right places and perfectly twisted- sounds like a nice blind date. This is top o' the line DCCI breeding with Super Bowl, Jamakizm and Over Kill blended with Top Caliber for a guarantee of exceptional horn, all with a flashy tri-color paint job thrown in for good measure. 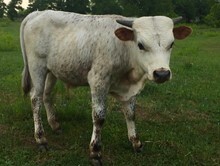 Just gave us a beautiful cinnamon roan bull calf from Jest Command who will be one to watch.